A reader disagreed with this mentioning the importance of self-love. So does love of self mean that duality is not necessary for love to exist? Could God have just not created anything and been happy with self-love for all eternity? Would it shock you if I told you that there is no such thing as self-love? It doesn’t exist because love is only manifest in a relationship involving two or more. Love is a divine impulse, and to manifest an entity has to serve, assist and provide benefit for another person, group or humanity itself. If we can’t really love ourselves then what is happening inside the person who says he does love himself? Generally what is called self-love is merely self-acceptance. It is difficult to love and serve another person if one loathes himself. Those who love the most are those who live up to the highest they know and accept themselves even though they are not perfect. Now when speak of self here I am talking about the conscious entity within the form. It is possible to have a lower aspect of love toward parts of yourself but for this to happen one must see himself as not one being but one composed of several parts. Some of these parts include the body, the emotional self, the thinking self and the personality. It is possible to have a lower aspect of love toward your body. Maybe a person thinks he is great looking and loves the way his body serves him. Maybe he thinks he has he greatest personality on the planet. This aspect of love can only surface when one sees himself as more than one. One part of his makeup can express an aspect of love toward another part. But if the person sees himself as a united whole then the parts are accepted but the love is then directed toward others. The disciple loses his life, or thoughts of self-love, and directs this aspect of God toward service to others. He realizes that in serving others with whom he has relationship that he is also serving himself. When this principle is understood he can then forget self because self is part of the group that will be taken care of through the spreading of love. One of the problems with understanding love is that there are several levels. The highest level that can be comprehended by most is the love that emanates from our spiritual self, called by many the soul or higher self. 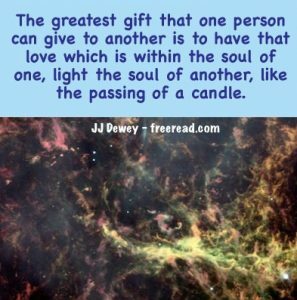 This love energy is then reflected down in mortal life through our mental and emotional selves. The emotional self distorts everything that is divine and interprets love in selfish terms. Its idea of love lies in possession and what the other can do for him, whereas the love of the soul is directed toward service rather than being served. True expression of love then requires a forgetting of self and a focusing on serving the greatest number possible while producing the greatest benefit. When the disciple focuses in this direction he finds that he has not lost himself, but has found himself and received much more self benefit than he did when he placed his attention on serving self.